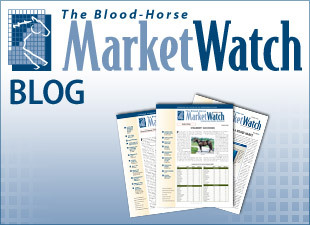 With the first of 2-year-olds in training sales behind us, BloodHorse MarketWatch compiled a list of the leading sires by average under tack show times and compared the average prices among those sires. The list, which included only sires with three or more sold, narrowed the field of 127 sires presented at either the Fasig-Tipton Gulfstream sale or the Ocala Breeders' Sales March auction down to 55. The average one-furlong under tack times by the progeny of the 55 sires ranged from :10 (all fractions in this article have been converted from fifths to tenths of a second) to :10.7. Among the 55 sires, 32 had at least one runner also work a quarter-mile. The two sires sharing the lowest average time of :10 were Adena Springs Kentucky's Ghostzapper and Lane's End Farm's third-crop sire Twirling Candy. Ghostzapper was represented by three juveniles sold so far this year; two worked an eighth-mile at the OBS March under tack show—one in :10.2 and one in :9.8—and another worked a quarter-mile in :21.4. His top seller was his fleetest, a filly out of the winning Arch daughter Gold Vault. The filly bred by Cherry Valley Farm is also a full sister to grade 1 winner Contested and a half sister to black-type stakes winners Mosler (War Front). The 17-year-old son of Awesome Again has a 2-year-old average of $453,333 so far this year. Twirling Candy also had two work an eighth-mile—both in :10 at the OBS March sale—and one, a quarter-mile in :21.4. The son of Candy Ride's top seller so far is a filly out of Make Music (Unbridled's Song), that agent Steve Young bought for $210,000 out of the de Meric Sales consignment. The filly was bred in Kentucky by Will Farish with the E.J. Hudson Jr. irrevocable trust. 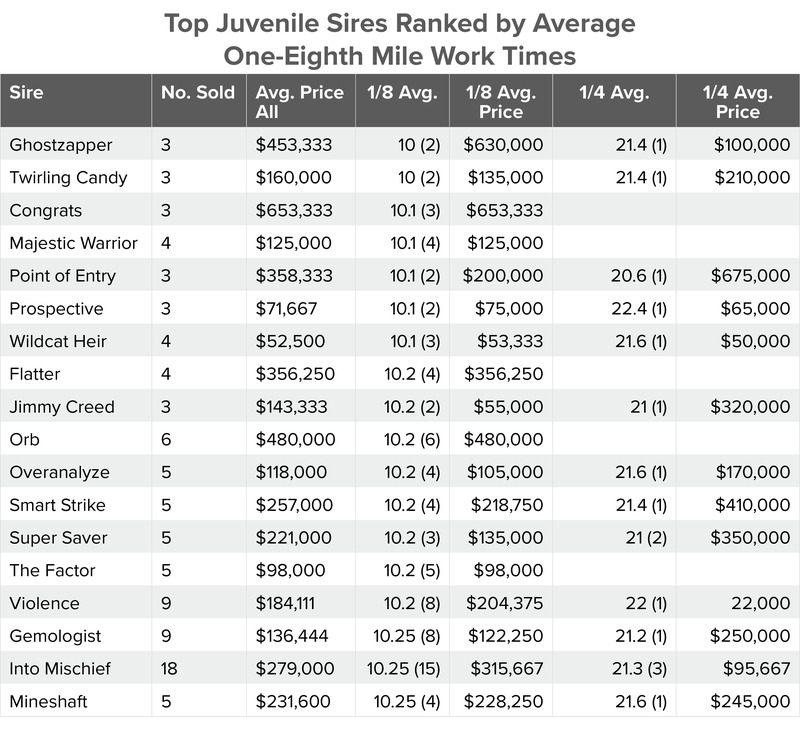 Five sires were co-ranked in third on the list with an average time of :10.1—Congrats, Majestic Warrior, Point of Entry, Prospective, and Wildcat Heir. Among these WinStar Farm's Congrats had the highest overall average price of $653,333 for three sold. His average had the biggest boost from a the $1.7 million OBS March sale topper, a daughter out of Azalea Belle who agent Kerri Radcliffe bought out of the McKathan Brothers' consignment. Among the sires with average eighth-mile times of :10.25 and below, six are freshman sires of 2017. Adena Springs' Point of Entry and Ocala Stud's Prospective had the lowest average times. Point of Entry's average price to date is $358,333, while Prospective has a $71,667 average. The freshman sire with the highest average price is Claiborne's Orb, who had six sell for a $480,000 average. Hill 'n' Dale Farms' Violence has been represented by the most sold to date, with nine averaging $184,111. The son of Medaglia d'Oro had eight work an eighth-mile for an average of :10.2.